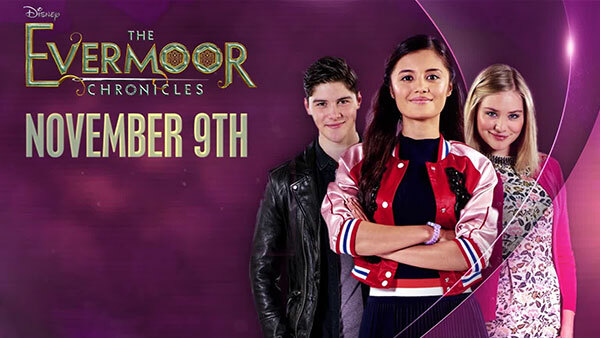 Disney Channel UK premieres its new, live-action fantasy series, The Evermoor Chronicles, Monday, November 9, 2015. The show is a spin-off of the Evermoor mini-series, which aired on Disney Channel UK; the US Disney Channel; Canada’s Family Channel; and Disney Channel Australia and New Zealand, in 2014. The Evermoor Chronicles is the first Disney series shot entirely in UK. The series focuses on Tara Crossley and her family, who have just moved to the village of Evermoor. Dwelling in Evermoor are the Everines — mystical women who can predict and affect the future, weaving their tapestry — and Tara is one. Tara just wants a normal life, but dark forces are threatening to destroy Evermoor. The Evermoor Chronicles features Naomi Sequoia as Tara; George Sear as Sebastian Crossley; Georgia Lock as Bella Crossley; Finney Cassidy as Cameron; Jordan Loughran as Sorsha Doyle; Sammy Moore as Otto; Georgie Farmer as Jake Crossley; Alex Starke as Ludwig “Ludo” Carmichael; and India Ria Amarteifio as Lacie Fairborn. Watch the Disney UK “First Look” video, below. What do you think? Did you watch the Evermoor mini-series? Do you like the sound of The Evermoor Chronicles? Do you plan to check it out? More about: Disney Channel TV shows: canceled or renewed?, The Evermoor Chronicles, The Evermore Chronicles: canceled or renewed? the series isn’t over but can someone tell me if there is a season 2 pls i know its not out but will there be one ???? I would really like for the series to go on. The just left a cliffhanger! Why did it stop if the 5th episode showed the preview for the 6th episode. It would have been an amazing series bring it back PLEASE…..
Why dod it atop if on the 5 episode it showed the preview for the 6 episode. It should have stayed on for longer………..
Is there any way i can watch this series in the us! PLZ HELP!! !